Apollo Belvedere, ca.1799. Copy of the head of the original in the Vatican. Marble, 66.1 x 56.2 x 40 cm. Gift of Henry Pickering, 1824. Modern visitors to art museums have the reasonable expectation of seeing original works of art. Except for ancient Roman copies of older Greek sculptures, museums do not, as a rule, knowingly exhibit copies or objects with questionable authorship. Within certain limits, however, this has not always been the case. From the 1790s, when the first art organization was founded in the United States, through the American Civil War, it was almost impossible for art academies, libraries, athenaeums, or museums in this country to acquire original examples from all the great epochs of Western art. Attempts to do so were fraught with logistical problems, could easily be delayed by political changes, or, more often, were prohibited by fiscal limitations. In lieu of originals, copies of good quality were deemed not only desirable but also necessary, and good copies by competent painters, engravers, casters, or carvers were energetically sought and enthusiastically acquired. The copies that were easiest to procure were engravings based on paintings by famous artists; more desirable were copies painted in oil on canvas, making them as close to the original as possible, at least in terms of medium. These reproductions were often made by professional copyists or by artists with no other work at hand. In terms of sculpture, plaster casts—or copies in fine marble, if budgets allowed—of ancient Greek and Roman sculpture were also fairly accessible, although one had to be cautious about quality. Naturally, these objects were usually expensive, not to mention difficult to transport. Again, as with paintings, it was important that copies of sculptures be as close to the original work of art as possible, and acquisitions often came with assurances that a particular copy had been made using molds taken directly from the original. 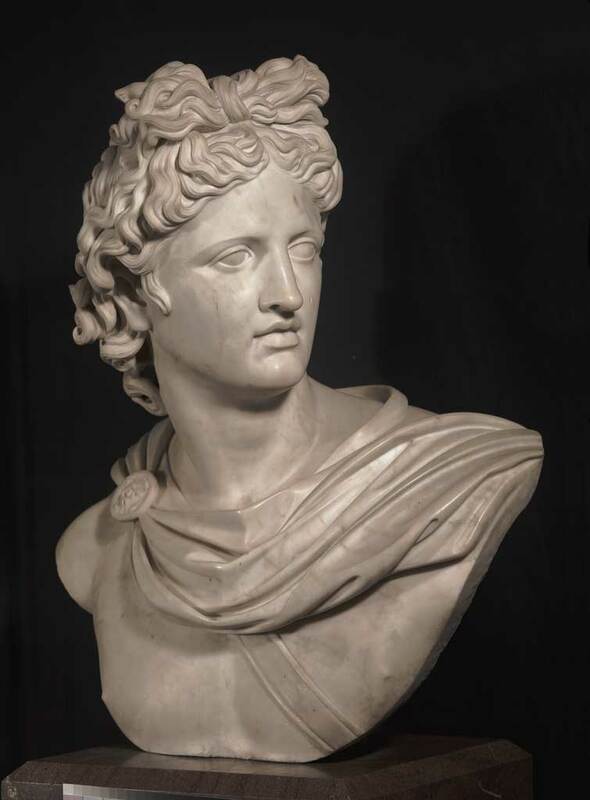 One of the earliest acquisitions of a copy of an ancient sculpture by the Boston Athenæum is an especially fine marble reproduction of the head of the famous Apollo Belvedere. Although the early history of the original full-length figure at the Vatican is unclear, it is known to have been in the collection of Pope Julius II (Giuliano della Rovere) by 1509. Julius installed it in the Belvedere Courtyard of the papal palace, thereby giving the sculpture its modern designation. Molds were first taken of it in 1540 for the purpose of copying it for François I of France. From that time until well into the nineteenth century, every fine collection of casts included a copy of the Apollo. Most of these were made of plaster, although especially wealthy or well-placed patrons—royalty, for example—might afford a bronze cast of the work. Marble was also used, especially when a collector wanted a copy of only part of the original, such as the head, as is the case of the Athenæum’s Apollo. Despite its tremendous weight, marble had the advantage over plaster because it increased the aesthetics and longevity of the copy and gave the copyist the chance to replicate and even elaborate on the details of the original. The Athenæum’s bust of the Apollo is of especially fine quality, obviously having been carved by a master marble carver, presumably in Italy. Indeed, the quality of the bust stands as a tribute to the erudition and aesthetic sensibility of the man who gave it to the Athenæum, Henry Pickering. Although Pickering (1781-1838) was born in Newburgh, New York, he was a member of an old and distinguished Massachusetts family: his father, Col. Timothy Pickering, served with distinction in the American Revolution and in the administrations of presidents George Washington and John Adams. After a youthful apprenticeship in Philadelphia, Henry Pickering settled in Salem, Massachusetts, where he had some success as an importer. By that time, he had developed a taste for art, and through his many travels was well versed in its history. In 1822 he published the first of several volumes of poems, The Ruins of Paestum, and Other Compositions in Verse, which clearly indicate his admiration for ancient history and classical culture. In March 1824, Pickering wrote to Josiah Quincy at the Boston Athenæum announcing his intention to give the institution two works of art he had acquired during his travels: a copy of Sir Thomas Lawrence’s portrait of Benjamin West by the Anglo-American painter Charles Robert Leslie (which remains in the Athenæum’s collection) and “a fine copy” of the head of the Apollo Belvedere.. Pickering went on to express his personal admiration for the “purity of the expression” of the bust and reported that, to his best knowledge, it had been carved some years before for “a member of the French Directory, possibly [Paul] Barras.” Just as the bust was about to be shipped to France, he continued, Barras fell from power and the bust of Apollo, with a number of other “precious marbles,” was sold to “an American gentleman at Leghorn [Livorno]” for one hundred fifty dollars. Presumably, it is from this “American gentleman” that Pickering acquired the bust. Although it is difficult to corroborate Pickering’s provenance of the bust, there can be little doubt that he appreciated the appropriateness of its place in the Athenaeum. The Athenæum, moreover, immediately treated it as a worthy addition to its growing collection, and when it arrived in Boston in the summer of 1824, no less a figure in the Boston art world than Washington Allston was consulted on its proper display. The gift of the Apollo and the portrait of West did not mark the end of Pickering’s affiliation with the Athenæum, however. In fact, it seems likely that the memory of his generous gifts in 1824 played a role in the Library’s later decision to buy several paintings from Pickering’s collection. In 1838 a group of these paintings were apparently shown in Boston, and the Athenæum’s Trustees immediately allocated $750 for the purchase of three of them: a landscape thought to be by the Dutch painter Jacob van Ruysdael; Christ and the Woman of Samaria, a painting in the style of the seventeenth-century Italian artist Carlo Maratta; and Luca Giordano’s The Flaying of Marsyas. At the same time, Pickering gave the Athenæum Carlo Cignani’s Hagar and Ishmael and a Head of St. Paul, which was also thought to be by Luca Giordano. Thanks to Henry Pickering, therefore, the Library’s ability to display European art—past and present, in original form or copied—was greatly enhanced. David B. Dearinger, from, Stanley Ellis Cushing and David B. Dearinger, eds., Acquired Tastes: 200 Years of Collecting for the Boston Athenæum (2006): 258-261. Copyright © The Boston Athenæum. Scholarly study of the history of copies has recently increased, starting with Francis Haskell and Nicholas Penny’s superb Taste and the Antique: The Lure of Classical Sculpture 1500-1900 (New Haven and London: Yale University Press, 1981). For a complete analysis of the sculpture and the history of copies of it see Haskell and Penny, 148-150. Lawrence’s portrait of West, painted in 1811, is at the Yale Center for British Art, New Haven, Connecticut. Henry Pickering, Salem, to Josiah Quincy, March 16, 1824, quoted in Swan, 136. Although of noble birth, Paul François Jean Nicolas Barras (1755-1829) joined the Jacobins during the French Revolution. Later, he opposed Robespierre, helped Napoleon achieve power, and was made a member of the Directory. As Pickering noted, Barras fell from favor and into political oblivion in 1799. Peter Thacher to Henry Codman, Secretary of the Athenæum, July 10, 1824, BA archives. Some indication of the importance of the Apollo Belvedere to the formation of nineteenth-century taste is the number and variety of forms of the sculpture that were eventually on view at the Athenæum. For example, in 1842, visitors to the Athenæum could see, all in the same exhibition, a “Marble copy of the Head of the Apollo Belvidere [sic]” a “Cast from the same,” presumably in plaster, and a “Cast of the Apollo Belvidere [sic],” presumably a full-size plaster (Boston Athenæum, Catalogue of the Sixteenth Exhibition of Paintings and of the Fourth Exhibition of Sculpture in the Athenæum Gallery [Boston 1842], 5). Trustees’ Records, 2 (1830-49): 97-98; Fine Arts Loan Accessions (1826-77): 13. The painting attributed to Luca Giordano remains in the collection (although its original frame was sold in 1905). Christ and the Woman of Samaria, in the style of Carlo Maratta, Cignani’s Hagar and Ishmael, and the so-called Jacob van Rysdael, downgraded to “Circle of Meindert Hobbema,” were sold at Sotheby’s, New York, in 1979.